Description: Rare Ptolemaic woodcut map of Italy from the 1541 edition of Ptolemy's "Geographia". Reduced by Laurent Fries from Martin Waldseemuller's larger map of 1513. Description: Italy. Early black and white woodcut after Ptolemy. Description: Two maps on one plate. The region of Padua (including Venice) and of Apulia after the work of Jacobus Gastaldi. Original colour. Description: Italy. Including Corsica and Dalmatia. Inset galleon. Description: Celebrated map of Italy from the first atlas in fine original hand colour. 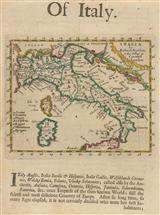 Description: Beautiful early map including Sardinia, Corsica and the Dalmatian Coast. Embellished with decorative cartouche, ship and sea monster. B&W. Description: John Speed's exquisite map of Italy embellished with miniature city views along the upper border and costumed figures on both sides. English text on verso. Strong impression. Description: Early and important map of Italy based on G. Mercator's geography and embellished with a ship and sea monster. Original hand colour. Description: Italy. Attractive early map with decorative cartouche. Coloured. Description: John Speed's exquisite map of Italy embellished with miniature city views along the upper border and costumed figures on both sides. English text on verso. Coloured. Description: Stunning map of Italy, Sicily, Sardinia and Corsica. Elaborate cartouche in dedication to Cosimo III de'Medici. Original colour. Description: Italy. Ornate cartouche and superb original hand colouring. Description: A detailed miniature map of Italy with a panel of descriptive text. Coloured. Description: Highly decorative map of the Gulf of Venice and Adriatic Sea, with the coasts of Italy, Slovenia, Croatia, Montenegro and Albania. Strong impression. 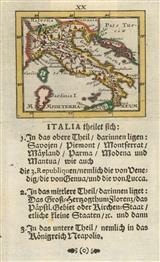 Description: Miniature map of Italy with Gothic German script below listing the regions. Coloured.